An unexpected event has happened at the PGA Championship on August 16, 2009. 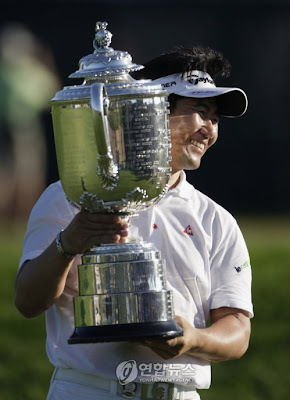 A Korean named Yang Yong-Eun, has beat Tiger Woods and become the first Asian male golfer to win in the major championships. This shocking event has spread out around the world and apparently, this is the 3rd most shocking event in sports' history. After the tournament, his rank jumped up from 110th to 34th and he became a well-known sports celebrity.